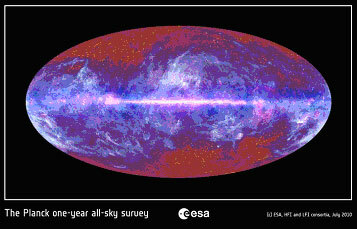 The microwave sky as seen by Planck.1 This multi-frequency all-sky image of the microwave sky has been composed using data from Planck covering the electromagnetic spectrum from 30 GHz to 857 GHz. The image was derived from data collected by Planck during its first all-sky survey and comes from observations taken between August 2009 and June 2010. Image: ESA/ LFI & HFI Consortia. On July 5th 2010 the European Space Agency (ESA) released its first one-year-long all-sky survey map of the cosmos as seen by the Planck-satellite-borne microwave telescope. The image shown here is the result. Nice picture! 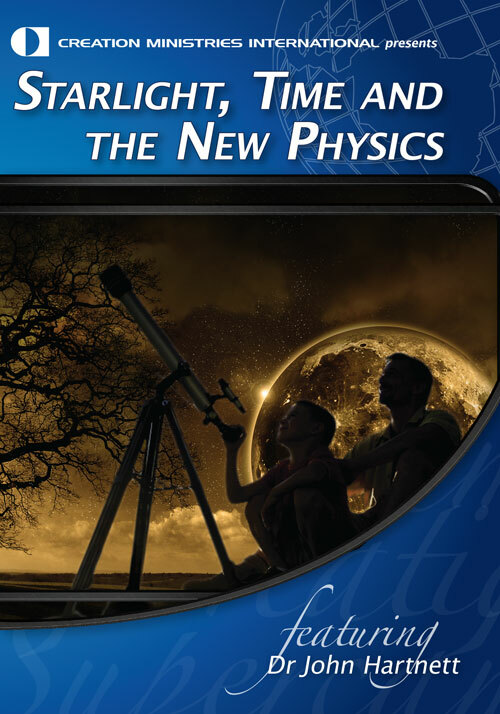 It not only provides new insight into the way stars and galaxies form but also tells us how the Universe itself came to life after the Big Bang. 2) the Big Bang. This is radiation that is now seen at microwave frequencies, and known for four decades now as the Cosmic Microwave Background Radiation (CMBR). A large portion of the image is dominated by the diffuse emission from the gas and dust in the Galaxy. However, the mottled structure at high latitudes in this image is the CMBR. The mottling represents tiny temperature fluctuations seen after a near uniform radiation flux at a constant 2.7 K temperature has been extracted. The fluctuations are claimed to be representative of the primordial density variations in the Big Bang fireball from which today’s cosmic structure originated. 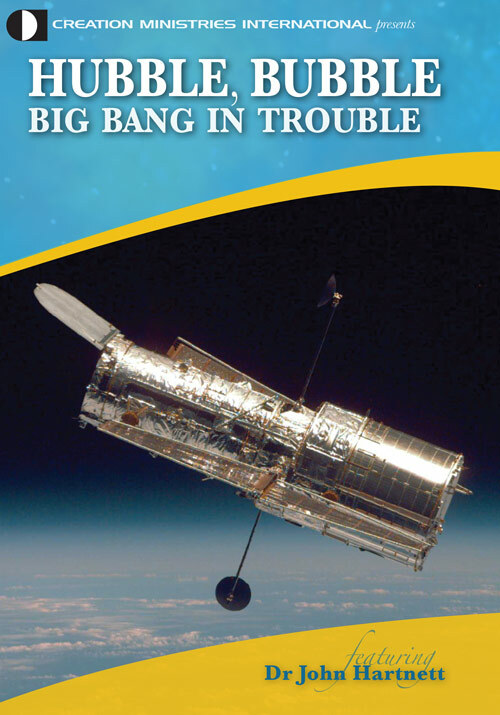 … if there was no naturalistic big bang, but instead God ‘stretched out the heavens’ in an awesome display of supernatural power, even eliminating all other naturalistic causes for the CMBR would not mean that a big bang had been demonstrated. But how do we know that this radiation comes from the big bang? Firstly, this cannot be a ‘photograph’ of the big bang itself, because it is very feeble low temperature radiation, and it is assumed that as the universe expanded the very hot unobserved putative radiation from the initial putative primordial fireball was adiabatically cooled to this radiation we see today. Secondly, only by eliminating all other possible sources of the CMBR radiation could you definitely say it is from an alleged ‘big bang’. But that last statement, like big bang theory itself, assumes a naturalistic cause—no Creator. 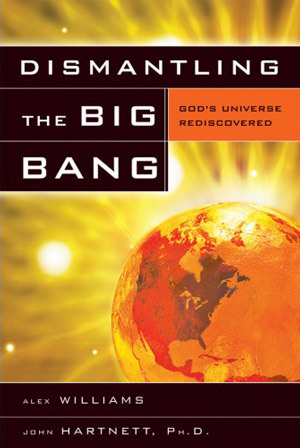 So, if there was no naturalistic big bang, but instead God ‘stretched out the heavens’ in an awesome display of supernatural power, even eliminating all other naturalistic causes for the CMBR would not mean that a big bang had been demonstrated. And it (inflation) must be correct (remember, no Creator, no purpose) because it solves so many other problems with the big bang, like the isotropy problem, flatness problem, the horizon problem, problem, problem, etc. … . www.esa.int/esaCP/SEMF2FRZ5BG_index_1.html accessed 7 July 2010 Return to text. 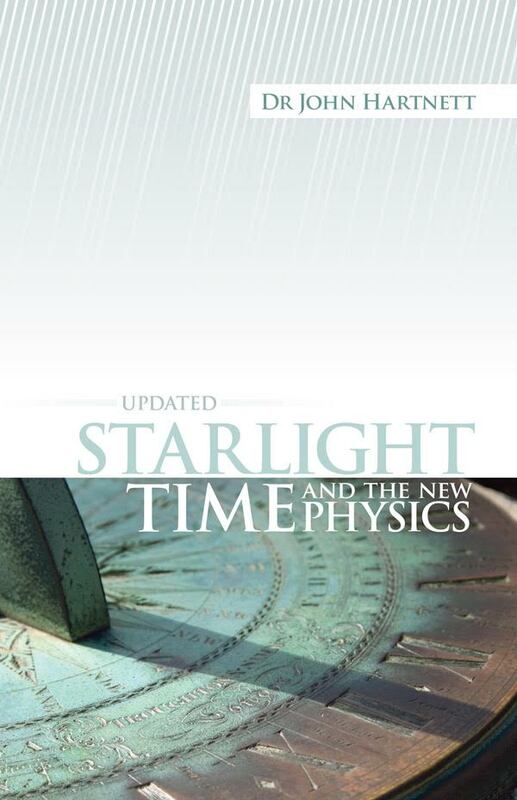 www.esa.int/esaCP/SEMF2FRZ5BG_index_0.html accessed 7 July 2010 Return to text. [Dr Hartnett is a full Research Professor at the University of Western Australia—Ed.]. Return to text. At this point spacecraft are free from gravitational forces and sort of just hover there—an ideal place in solar orbit to place a scientific satellite. Return to text. www.heraldsun.com.au/news/world/big-bang-telescope-probe-captures-first-image-of-our-universe/story-e6frf7lf-1225888309540 accessed 7 July 2010 Return to text. http://www.nzherald.co.nz/world/news/article.cfm?c_id=2&objectid=10656869 accessed 7 July 2010 Return to text. “He hath made every thing beautiful in its time: also he hath set the world in their heart, yet so that man cannot find out the work that God hath done from the beginning even to the end.” Eccleciastes 3:11 ERV Return to text. ‘Cosmology is not even astrophysics’ Return to text. Genesis stands in stark opposition to big bang cosmology; firstly the millions of years issue, and secondly the order of events. Genesis has the sun and stars created after the earth exists—big bang thinking has them existing millions of years before the earth. Return to text.